Cancer is considered as one of the dangerous medical condition today. It is not because there is no treatment solution but fighting cancerous cells is never enough. 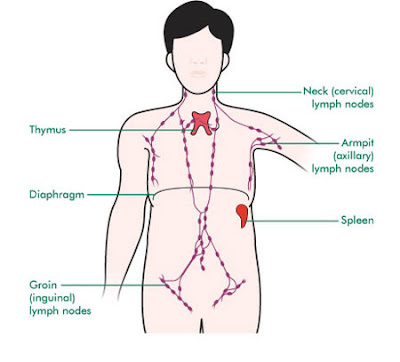 One example of cancer is lymph node cancer. What do you know about this condition? Our body has blood vessels to distribute blood and our body also has lymph vessels which has similar function but instead of blood, this vessels distribute a substance which looks alike clear water fluid called lymph. The function of lymph is almost similar to red blood cells to distribute oxygen and nutrients in the body cells but lymph system is closely related to immunity system because it also carries white blood cells which has function to fight infection caused by viruses or bacteria and at the same time carries away carbon dioxide to be washed off the body system. It is true that the lymph system has prominent role in maintaining our body’s immunity system. Without which our body will be easily infected and get sick. The main cause of lymph node cancer is mostly not started in the lymph system but from somewhere in the body and then the cancerous cells will infect the lymph system and cause the condition. In other words, there are no such specific things you could do to prevent this kind of cancer because in most cases, lymph node cancer is only happen as secondary cancer not primary. However, healthy lifestyle is what you should do to avoid all kinds of serious medical problems. If you really care with your life and then start to change your lifestyle to the better by consuming only healthy food, avoid junk food is possible and do exercises. Cancerous cells are closely related to the low level of antioxidants in the body while immunity system is not functioning optimally. Just like any other cancer cases, this kind of cancer is also hard to be identified in the early stages. Why? It is because the size of lymph vessels which are really tiny and almost hard to find. However, whenever it is infected by viruses or even cancer the vessels will be swollen and get larger and that’s how we know there is a serious problem in the lymph vessels. This condition could lead to other complication since the distribution of white blood cells will be disturbed as well as the immunity system. Once someone is diagnosed with lymph node cancer, what they should afraid of is not the cancer itself but the after affect caused by the cancer.